Hi! Looking for the Wednesday Wandering? Just page back and join me as I look into some of the amusing challenges offered when writing historical fiction. The come back and help me educate Alan in the complexities of the American school system. and all our other American school dramas intelligible for you. What’s your next question? ALAN: There are so many weird words and concepts that I’ve come across over the years that it’s hard to know where to begin. How about this… what’s a class ring? JANE: A class ring is a ring, usually crafted in gold or gold-colored metal. Often, the emblem of the school is worked into the band. The “stone,” I believe, is in some way representative of the school colors. You usually get your ring sometime late in your junior year – probably because by then it seems likely you will graduate from that school. However, I’m guessing on a lot of this. I went to an all-girls’ Catholic high school. Our class ring was a tasteful affair: gold band set with a rectangular black onyx bezel on which was a very small representation of the school seal. I wore mine quite happily until I discovered that something in the band gave me hives. Class rings gained a special significance because, in the days of yore, if a guy gave a girl his ring to wear, that meant they were “going steady.” Not quite an engagement ring, but close. Do you have any emblem similar to the class ring, something that marks you as having attended (and presumably graduated from) a specific school? How about those “class ties” I’ve read about? ALAN: No – we have absolutely nothing like that. That’s why I find the idea so odd. I can’t imagine any circumstance where I’d ever want wear anything representative of my old school. You mentioned our “class ties” – I think you actually mean “old school ties.” They are really only associated with the old, and extremely snobbish, public schools (you’d call them private schools) like Eton and Harrow and Rugby and they are yet another manifestation of the British class system. A friend of mine got a scholarship to Cambridge University. He told me that he felt quite out of place there – it was full of public school people and old school ties and he, being a simple working class Yorkshire lad, just couldn’t fit in. JANE: Right! Old school ties… Thanks for clarifying. ALAN: Oh, it’s all perfectly logical. In medieval times all schools were private schools, generally run by the church, with lots of complex rules about who was (and was not) eligible to attend. From the 16th century onwards, schools that were independent of ecclesiastical control started to appear. These schools were open to all (hence they were public schools). However they had no source of funding so in practice they were only open to all who could afford the fees. In other words, the sons of the gentry. And that had the side effect of making the public schools private in all but name. More modern, government-funded schools are properly public in the true sense of the word. But we don’t call them public schools because that’s what public schools are called. JANE: That’s wonderful! What a perfect, logical explanation. Thank you for solving a mystery that has puzzled me for decades. Now, where were we? My high school was very formal, so we didn’t have the embarrassing quotation thing. Therefore, someone else is going to have to explain that one to you. 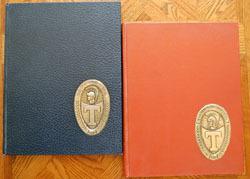 However, yearbooks also often served as autograph books. At the end of the year, students raced around getting their books signed by friends, especially those who were graduating. ALAN: The closest we ever got to that was a group photograph. It was taken on a panoramic camera. Traditionally, once the camera has swept past one end, someone is supposed to run round behind the group (out of camera shot) and then stand at the other end ready to be caught as the camera completes its traverse, thus giving the impression of twins. I’m not sure anyone has ever really done this, but that’s the urban legend. However since we actually did have twins in our class, the teachers deliberately placed one twin at each end to give the impression that the prank had been played, even though it hadn’t! We all enjoyed the meta-joke. JANE: I like it, too… Especially since the teachers got into it. I know you have other questions, but I am reminded that I have work to do. Let’s take them up next time. Meanwhile, I hope our readers will fill you in on other details of class rings and yearbooks. This entry was posted on June 28, 2012 at 1:00 am and is filed under Thursday Tangents. You can follow any responses to this entry through the RSS 2.0 feed. You can leave a response, or trackback from your own site. I wonder if they’ll get to the point where they do year books and class rings for middle school, too? I think it’s different schools, Jane, but my high school class ring has my birth stone in it, not a school-color stone. You’re not the only person I know who had trouble with the ring metal. You’d think they’d formulate it better. I’ve still got my class ring, but I’ll admit I’ve contemplated having it recast into something that’s currently meaningful. So much for valued connections and memories, I guess. It’s also possible to get a college class ring, but the only people I’ve noticed doing that tend are businessmen who want to flaunt their associations. Often they have their fraternity name engraved in the stone too. You know the type, perhaps? As for the year book, it’s basically a memento. I’ve still got mine, but I haven’t opened it in a long time, either. Oh well. _Get_ to the point? My junior high was doing year books 50 years ago! Gr 7 was the first year we individual as well as class photos taken. No class rings, though. That isn’t typical of schools in Canada. Some places, especially universities, have school rings you can buy, but they aren’t dated. Quite a few engineering schools award an iron ring to graduates, but the ones I’ve seen aren’t marked. You left out the military academies, which are all big on class rings. Hence the not especially complementary expression ‘ring-knocker’ for officers who have graduated from one of them. I still have my high school ring–and my college ring–and I never wear either one. Just about everybody got one back then (’50s and ’60s) but I think, like the yearbooks, more for the memories. Considering my small HS and college, it certainly wasn’t for the prestige. The color of the stones were associated with the schools’ colors, in my case. In retrospect, I could have saved some bucks by not getting them — but I’d still have gotten the yearbooks. Does anyone think yearbooks will die out and become electronic? I found myself wondering about a “year-page” on some internet site where people could keep in touch after graduation. I bet someone has set these up already. Indeed, you (Jane) are exactly right. Not only are schools shifting to electronic yearbooks because of budget constraints, but even *old* yearbooks are being digitized and made available electronically!